Chay Genoway is a hockey player from Morden, Manitoba. Genoway played five years with the University of North Dakota (the last two serving as their captain), and is the fourth-highest scoring defenceman in UND history. After graduating from the University of North Dakota in 2011, he signed a one-year contract with the Minnesota Wild. Genoway played two years with the Houston Aeros, the Wild’s AHL affiliate. Following his seasons with the Aeros, Chay was traded to the Washington Capitals organization. After two years with the Hershey Bears (AHL), Genoway left North America to begin a career in the KHL, where he is currently playing for Finland’s Lada (Togliatti). Internationally, Chad Genoway has represented Canada at the Spengler Cup, the Deutschland cup, and in preparation for the 2018 Olympic Games. 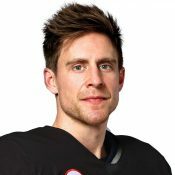 The 31-year-old was named to Canada’s Olympic men’s hockey team in January, and will play at his first Olympic Games in PyeongChang.